I finally finished it! It took two years on and off but I finally finished my lovely poppy remembrance field. 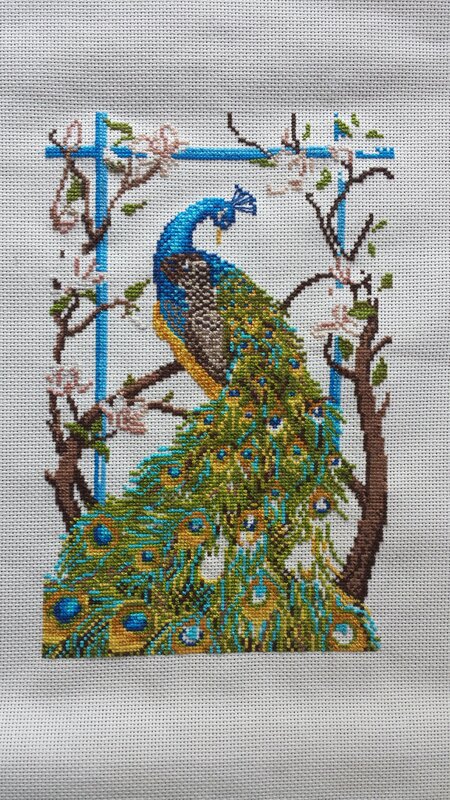 This cross-stitch project was my most challenging yet and at times made my eyes cross but it was worth it. Over 23,000 stitches. All that’s left to do is mount and frame it. I will post a pic when I get it all put together. Meanwhile I have already started a new project. A pretty peacock which I hope to get done by Christmas. My hubby doesn’t think I can get it done by then but after just one week I am well on my way. A pair of pants to hem, a button to fix, a hole to repair in a sock. I don’t know about you, but my sewing basket always has something in it to fix. And some things have been in it for YEARS! One day, instead of mindlessly wasting my morning surfing statuses online, I decided to fix whatever was in my sewing basket that I was putting off. I have a black, double-breasted peacoat that I stuck in my sewing basket 2 years ago simply because all three big, gold, buttons fell off. Before I put it in the basket for fixing I was holding the coat closed with my hands like a bathrobe and that really wasn’t working. With my two cuddly companions keeping me company, in 15 minutes I had all 3 buttons sewn back on and re-enforced so they wouldn’t ever come off again. Viola! It was like having a new coat! Also in the basket were tons of pairs of socks with holes in the toes. Not the heel but the toe. They are perfectly good socks but they must rub just right in my sneakers because all of them had a hole in the same spot. My husband says I need to cut my toenails more often but I laugh and say that’s not why. I spent that evening repairing the holes in six pairs of socks and put them right back into service. Heck at $15 a pair it’s worth repairing them instead of throwing them out, right? Lastly I have a red, half zip, collared, cable knit sweater that would be my greatest challenge so I saved it for last. In fact I didn’t even know if I could repair it. My skills in sewing are limited. I cross-stitch and can repair small things but I don’t know how to sew much beyond that and have only used a sewing machine a couple of times. This sweater was completely shredded and ripped unevenly in the arm pit. Don’t ask me how it got that way because I have no idea. I like wearing it for work because it’s warm, but it got embarrassing having a gigantic hole in my arm pit so I benched it into the black hole of my sewing basket more than a year ago. It took me a while. About 45 minutes but I did get it repaired. It isn’t perfect but I got it closed the best I could. Hey it’s a work sweater. I beat the heck out of my clothes at work so it doesn’t have to be perfect. So to recap. Instead of throwing perfectly good clothes out, I repaired a coat, a sweater and six pairs of socks. That’s got to be about $150 I saved! Also I wasn’t on the Internet or Facebook or in any other way connected to the cyber world while doing it. That made me feel wonderful! Ok folks admit it. You’ve got stuff you have been putting off because you say you don’t have the time. However, you have time to check out your Facebook news feed or read what Kylie Jenner is wearing on an airplane or how Mariah screwed up on New Years Eve, right? I know, I am guilty too. It’s so easy to get distracted and lose an hour on the computer. Now when I start to lose my personal focus I just ask myself “what else should I be doing?” Works every time! There is always something that needs to be done.